In the market for simple add on services? I got you covered! Spring has sprung. It is officially prom and wedding season, and I know how busy salons and spas are. Injections, plump lips, and DIY lip treatments are all the rage. Why not add a simple collagen lip mask to any service? This mask is an immediate, radiance-enhancing, intense smooth out express treatment for lip contour. Dryness and fine lines diminish and the lips feel soft, rosy, and soothed. 24K Gold helps infuse moisturizing doses of Elastin and Acetyl Tyrosine to condition and ensure a smooth, plump pout. Stimulates blood flow, promotes fullness, and re-hydrates for a long-lasting effect. Protects the lips against UV light, and keeps the lips moist to prevent them from accelerated aging and emergence of dullness or fine lines. Pro Tip: Pair with a 24k eye and neck mask for the full "gold treatment." Helps to keep lips plump and supple. These Collagen Crystal Masks contain collagen, amino acids, and natural plant essences to help firm, tone, moisturize and hydrate! Pro Tip: Offer a quick, natural sugar scrub for lips, then a mask for a luxurious lip treatment! Need some more ideas to boost business? Ask us! We are happy to help! Wanting Something Special For Summer? Give Gold A Try! Diamonds and Gold, two ever popular words that invoke a feeling of luxury and VIP status. If you're not currently offering a diamond or gold facial, the summer may be a good time to see how your clients respond! 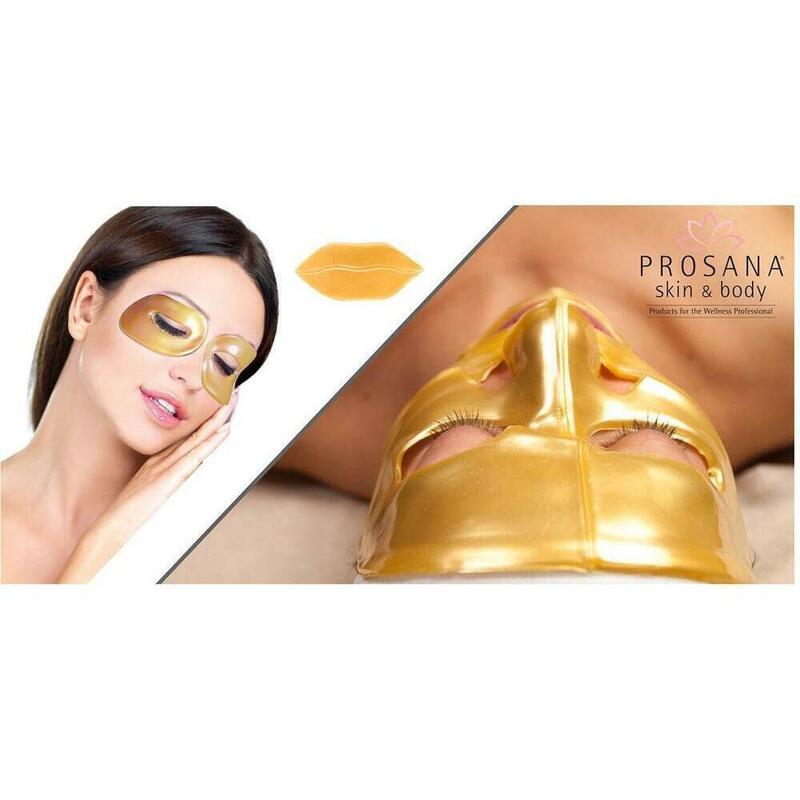 The Prosana 24 Karat Gold Facial Kit is just the thing to have your clients feeling like royalty! This is an easy way to bring in a new gold treatment without having to stress over which items to try! It's that time of year when your clients are gearing up for the Spring/Summer and getting their skin as glowing and healthy as possible. They may be looking for plump enhanced lips, relief from dry/chapped lips or just to bring back that youthful look. Lip Enhancer / 0.27oz by Ayur-Medic Skincare - great for adding moisture and plumping! Lip Renewal with SPF 50 by June Jacobs - many clients forget the importance of SPF for the lips, this is the perfect solution! Dr. Temt Vienna Eye Cream and Lipbalm - fights fine lines, hydrates and protects the skin! 24K Gold Lip Collagen Mask - use this luxurious mask to to add serious moisture, smooth out fine lines and enhance the lips natural fullness! Organic Cold Pressed Coconut Oil Lip Balm - what's not to love! Perfect grab and go retail item to have by the check out counter! Don't forget to talk to your male clients as well about protecting their lips! Everyone wants soft, glowing, kissable lips! Probably one of the most cliched, yet most enjoyable traditions during the holiday season is kissing under the mistletoe. You can take advantage of this yearly ritual by offering the fun and quirky Mistletoe-Ready Lip Treatment Add On. Whether you perform facials, body services, manicures, pedicures or hair services, this simple treatment is an easy sell during this time of the year. The product I recommend using is the Prosana Collagen Crystal Mask, the cost of which is $5.95 per 3 pack, or $1.98 per mask. Formulated with Amino Acids, Marine Collagen, Hyaluronic Acid and Rose Essential Oil, this mask will nourish, soften and moisturize the lips while helping to increase elasticity, increase plumpness and reduce fine lines and wrinkles around the mouth. Simply place the crystal masks on the lips, remove after 15-20 minutes. Do not remove any product left on the lips after the treatment. Instead, gently massage the lip area to help the remaining product be absorbed. And when it comes to profit, the numbers do not lie. If you charge your clients $5 for the mask add-on, you will earn $3.02 per treatment, which is a 152% profit. If you choose to charge you clients $10 for the add-on, which is more of an industry-standard price, you will make a $8.02 profit per treatment, or 405% profit! Click HERE to see our assortment of add-on Lip Masks! What types of add-on services do you find to sell more frequently during the holiday season? Wholesome Milk and Honey Masks at Wholesale Prices for Spas! Brand New from Satin Smooth!! Check it out ladies (and gents)... The brand so many professionals choose for their waxing services has just launched Milk 'n Honey facial masks that lift and tone. Blended with wholesome ingredients like Aloe, vitamin E, vitamin C and rose oil, these pro treatments promise to soothe and nourish clients' skin. There are eye, neck, face & lip patterns to choose from. All at a great price and cool slim box... this stuff is really flyin' off the shelves. Using a facial steamer prior to treatment really enhances the mask's ability..... why? I have no idea... I'm just a shipping guy! See our great Satin Smooth selection HERE!